My LGB UINTAH 20882 just arrived. I am very happy with her. She is old (22 years) but she runs fine even on my tight R1 switches. a) she is fiitted with a nice noise system She normally should feature the braking noise but I don't get it. The 4 switches are on the right position (on) but ... Is there a trick to get that braking noise. My engine is fitted with an LGB knuckle coupler I want to connect her on all my bachmann rolling stock having Bachmann knuckle couplers. As you can see on this picture the LGB engine coupler is too high. Before I take my screw driver I take some risk, I would like to know if there is a known solution to this small issue. The brake squeal may depend on the rate at which you slow down. It may not work if you make a gentle stop. Try coming to a rapid halt from about half speed. You need to balance CV168 and 169 to get the best brake squeal. CV 4, deceleration, seems to make a difference too. Trial and error seems to be the best way but start with the defaults in your manual. The locos speed needs to exceed the setting in CV168 and then when slowed below the setting of CV169 the brake squeal should start. If these are too close together, I find the result is poor. The best squeal comes with a moderately high CV4 and allow the loco speed to coast down whilst the controller is zeroed. It is switched on I assume ? - CV149 and then the correct bit - 5 I think. I love that loco. I was pulled by something similar on the Black Hills (of South Dakota) 1880 railroad. Can you just change the LGB knuckle coupling to a Bachmann Big Hauler one? The LGB one steps up higher but the shank looks to be the same level. 1 the break squeal does depend on the rate at which you come to a stop. as mentioned, too gradual and it wont trigger. 2 I don't have a simple solution. I run mismatched heights, and even on my rough and tumble track work, they seem to stay coupled. I don't recall if you can simply swap a bmann coupler for an LGB, but id try it. seems I recall the bmann centering pin needs to be clipped, and, Im not remembering if the alignment holes quite work either. 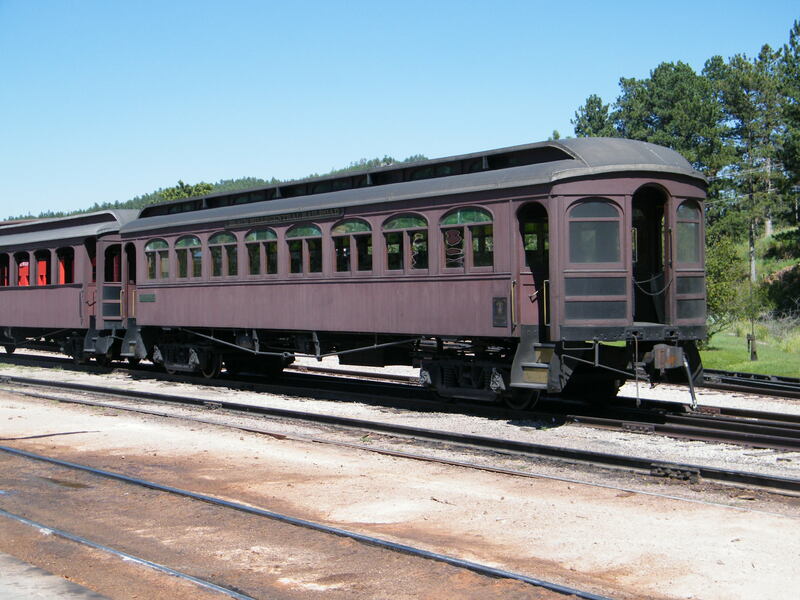 Id be more inclined to have an idler car with an LGB truck at one end and a Bmann at the other, if it was critical. Nice big lump of Metal (the real one) the model one is a lot of plastic and some metal for your money. Had a friends one here a year or three back, converted her to Battery Power for him. Aristo kit and Sound Board worked just nicely. I have a new black with no sound which I bought back in the CLOSE OUT SALE days. I also sourced a USA trains UINTAH RY.Co. caboose to go with it which is very similar but not the same as the Aristocraft classic caboose. I prefer the USA trains caboose because it's sides drop down lower and has a better narrow gauge look rather than sitting high on it's bolsters like the Aristocraft one does. I made a long trip on my railroad lasting several minutes under 16.5 volts and stoped sharply my engine : no braking noise. I got all the other noises but not that one so far. For the coupler, I might change the lgb coupler by a bachmann one. For the moment I can connect the two couplers. The train is running fine even with 8 cars but not secure. Stevedenver, do you lubricate the engine sometimes. Particularly the siderods. Lgb does not communicate so much about that. For Bachmann it is recommended to lubricate every twenty hours. Yes, lubricate: the axels at the point they meet the frame, 1 drop; i use graphite or teflon powder on side rods and valve gear so as to not attract outdoors grit, but, plastic compatible oil works ( but may need to be periodically stripped and reapplied); lube motor and gears in the gear box with Lgb grease, moderately. Keep an eye on the tire treads and back of the wheels, as they eventually get dirty and the treads slightly pitted, since they have no pick up shoes. I use a track abrasive eraser. Sometimes lighter fluid for sap and other track related gunk. Try running your loco again with neither a hard or very slow deceleration. The brake sound can be tricky. Experiment a bit. Slow from road speed into the station, but still rolling, then a slightly greater deceleration to a stop. Sometimes, after the full throttle thing, as i mentioned, , i will run the loco at about 10v,-12v, with modest consist, and sometimes at this voltage, you may hear brakes sounds on an upgrade or curve which cause slight slowing. This occurs not only on the uintah, but my euro mallets, and, an older sachsen mk IVk . All of them have braking somewhere between med slow, and the a distinct slow to stop. Sorry, its hard to articulate, but youll get it. The brake sound takes slight finesse. Otoh, its not that hard, but, yours may not be working. Fwiw, do you hear anything clattering around in the boiler? If so, its possible a component came off the board. I mention this unlikely scenario because This happened to my euro mallet. It was easy to find where and how to reattach, as they are a three pin chip, and it was easy for me to see the place on the board where it came loose. Thankyou stevedenver a lot of useful information for me. I will use all that including shaking the engine just in case one component get loose !! This may not help, if you do not know what CV's are, but there is a CV where each 'bit' controls if an effect is active under analogue control..
You may also find you do not get an effect if you have not run for (say) 30 seconds or more. I only have an Aristocraft Mallet here at the moment, so am unable to test his for you. is CV an acronym for something ? is CV a software instruction .... ?? CV means configuration variable, terminology used in DCC to configure the decoder to perform in certain ways, like sound whistle when you press F1, and so on. Aria31....any luck yet with braking sounds? No I was not successful in getting this brake noise. I tried several speed profiles , running duration , ... etc. No way . The only thing I didn't do is to ear if a component is loose. What is strange is that all other noises are fine. I have switch off and on the brake switch. My next step is to make the lubrification as the engine might have not been lubricated over the last 10 years. Shelf life from the previous owner. Done that trip, very nice. It's close to Mt. Rushmore. A lot of the cars are old interurbans, from Oregon, I believe.